My dad's birthday was this past weekend and I made him a gift and I bought him a gift. The gift I bought him happened to be Made in USA! 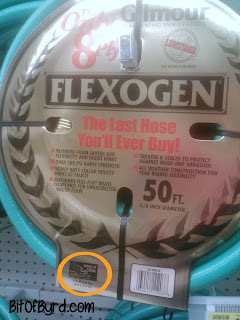 I found this hose at my local hardware store. They were having a father's day sale and I had a coupon when I bought it. Cant beat a good deal and planning ahead. Advanced production methods using quality materials combine with our greatest resource, Gilmour people — skilled and dedicated men and women. The result: reliable, hard-working, long-lasting products that bring customers in and keep them coming back. The two hoses my dad currently has had welded themselves to the sprayer and one developed a hole and it leaks really bad when trying to use it so this should be a welcome change. What kind of finds you make this weekend?